This unit is responsible for the safekeeping of records. It is divided into three areas: Data Management, Alarm Enforcement, and Custody Records. Acting as a liaison between the courts, attorneys, and the public with regard to furnishing information. 407 South State Street in Syracuse, New York. Hours of Operation are: 8:00am to 4:00pm. The public may obtain accident/incident reports and pistol license applications from this location. FOIL (Freedom Of Information Law): Records requested under FOIL are made available through the Sheriff’s Information Management Section. 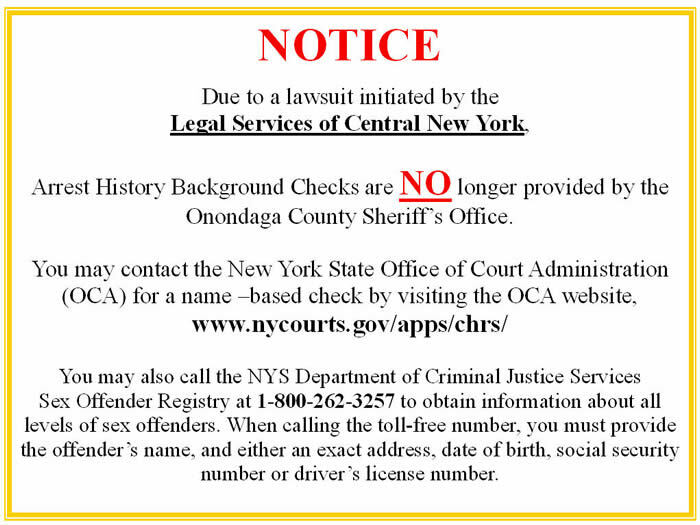 An appeal of denial of access to records may be made through the Onondaga County Attorney, Onondaga County Department of Law, John H. Mulroy Civic Center, 10th floor, 421 Montgomery Street, Syracuse, New York 13202. If there are any questions, the Records Access Officer can be contacted at (315) 435-3010. NOTE: If a specific case is considered open, you will not be able to obtain any paperwork until the proper authorization is given. Request in person: If you come in person, you must be directly involved with the incident and show the proper photo identification. You will be asked to pay the fee for the report at this time. Request by mail: If you are requesting a report by mail, you must include the DR# or Case# along with the fee, and a self-addressed stamped envelope. There may be an instance when you are required to come to the Records office to display proper photo identification before the release of paperwork.